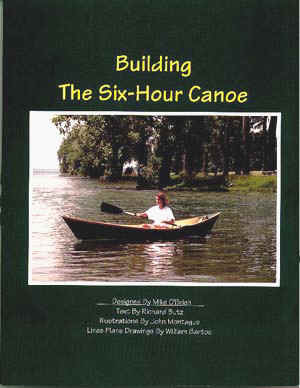 Building the Six-Hour Canoe contains scale plans, specifications, a tool list, step-by-step instructions, and even a helpful explanation of how to paddle the canoe. All the building operations are clearly illustrated with photos and sketches. The canoe is constructed from a single 4'x16' (or two 4' x 8' sheets) sheet of marine plywood and a few pieces of dimensional lumber and, with epoxy glued seams, is watertight from the moment it hits the water. When completed, the canoe is 15'3" in length with a 31½" beam. Inexpensive to build using ordinary tools and materials, the canoe gives everybody access to boatbuilding and a boat. Light, easy to carry and handle, it can be a personal favorite. Or it can be the ideal boat for introductory boatbuilding courses and for community and / or school based building experiences.